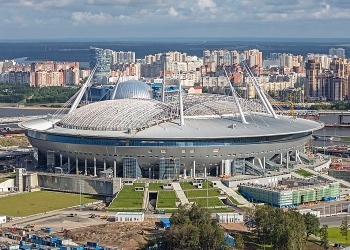 When Russia originally made their bid to host the FIFA World Cup in 2018 there weren’t enough top-quality stadiums already in the country, so they had to commit to building new ones. 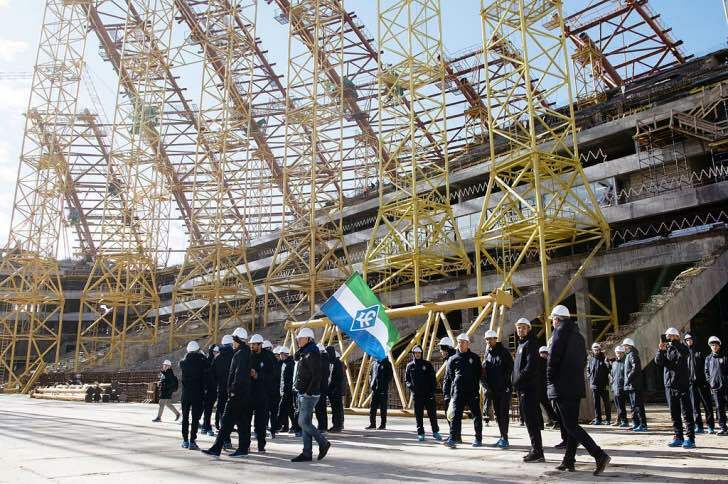 One such new stadium is the Cosmos Arena, so named because the region it’s being built in, Samara, is known for its links to the space industry. On top of that, the original design of the ground makes it look a little like an asteroid. 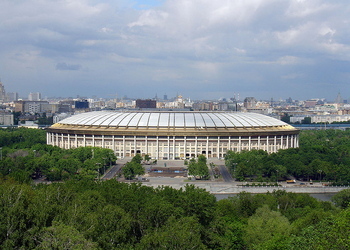 The official name of the ground has changed numerous times since its conception, with the Russians unsure what option to stick with. 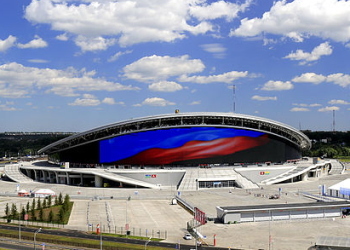 During the actual World Cup it will officially be know as 'Samara Arena', presumably to help people know where they're heading to watch matches. 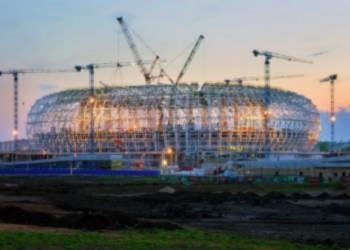 As with most of the new grounds being built in advance of the 2018 World Cup, there isn’t a huge amount of information available about Cosmos Arena. The closer the tournament gets the more information becomes available, so we'll keep updating this page accordingly. 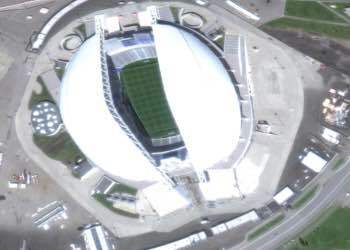 One thing we can tell you right now, though, is that Cosmos Arena will be the home of FC Krylia Sovetov Samara once the World Cup is over and done. 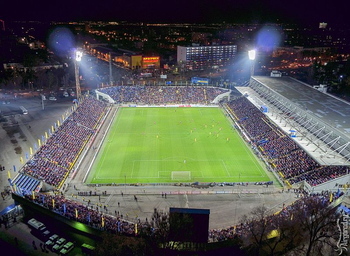 At the moment the Russian Premier League side play their games at the Metallurg Stadium, which has a capacity of 33,001. It seems odd that they'll need to move to any even bigger stadium, given that their average attendance for the 2016-2017 season in the Russian Premier League was less than 7,000. 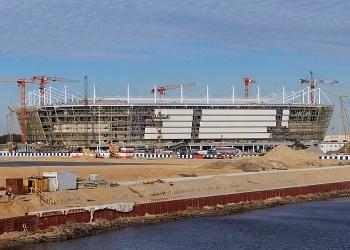 Regardless, for the 2018-2019 season they'll have one of the newest stadiums in Russia at their disposal. The Cosmos Arena will have an interesting design, partially looking like a 'typical' English stadium, with straight stands running along the edges of the pitch. However it will also take on the design more common to European grounds of rows of continuous seating over two tiers. Train - It will take you close to three days to get to Samara by train from London, so we’d recommend flying as a first option. At the time of writing the closest train station once you’re in the city is in the city centre, though the Russians have built Metro stations closer to their new grounds in some of the other cities. For now, you might prefer to get the bus. Bus - The 50 and the 1K both run close to the ground, but it’s still a bit of a walk. If you’re heading to the stadium specifically for World Cup matches then you’ll almost certainly find that there are buses being laid on to transport you out to the Arena. Car - The 36K-91B is the main road that runs closest to the Cosmos Arena, so if you’re driving your best bet will be to head towards that and then follow the signs. By Air - Kurumoch International Airport is less than fifty miles from the centre of Samara and is the closest airport to the city. Taxi - A cab from the centre of Samara out to the stadium will cost you about 190 rubles and take in the region of fifteen minutes. The beauty of building a football ground from scratch is that you can essentially do whatever you want, so it seems likely that there will be some parking available once the stadium has been completed. It's unclear what the plans are on that front at the moment, but we'll update this section once we've got a bit more information. 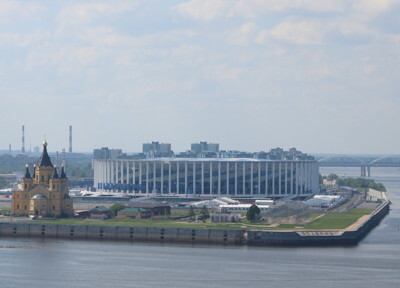 The Dubki Hotel is the closest on the list to the Cosmos Arena, but it’s still about a forty minute walk away. There are more than thirty-five rooms here, but it’s the facilities that you’ll be most impressed with. There are three indoor tennis courts, for example, as well as an indoor pool. There’s a restaurant and a conference centre here, plus there’s both free parking and free Wi-Fi, should you wish to make use of either. More details. Located about three and a half miles from the stadium, Hotel Moya is about double the size of the Dubki Hotel and features both a fitness centre and a conference suite. There’s even a shop inside the hotel, should you wish to pick up any sundries. There’s a restaurant where you can get a breakfast that’s included in the price of your stay, plus there’s free Wi-Fi if you want to get some work done. If you’re driving then you’ll be pleased to know that you can park for free in the hotel grounds. More details. With just shy of two hundred rooms, the Renaissance in Samara is definitely the largest hotel on our list. It’s just over four miles from the ground and it boasts a fitness centre complete with indoor pool. There are two restaurants in the hotel and you can get breakfast there in the morning. There’s self-parking for the drivers of you out there, plus free Wi-Fi if you’re a worker. There’s a terraced area outside if you want to get some fresh air or the weather’s good. The name of this place will tell you everything you need to know about it. An Irish bar with Guinness on tap and delicious European food on the menu, it’s the best place in Samara to head to if you’re feeling a bit homesick. As with most Irish pubs it’s also somewhere you’ll be able to watch some sport if that takes your fancy, thanks to the numerous TV sets they’ve got dotted around the venue. It’s not the largest place in Samara, but there are loads of tables and it’s got a pleasant, welcoming feel to it. Maximillian’s is part of a chain of pubs and restaurants throughout Samara, the venue is about so much more than just showing sport. There are any number of events that are put on throughout the week, including the likes of trivia nights and live music. Food such as Viennese Pork Schnitzel adorns the menu, so you’ll be able to get a bite to eat if you want to. Having said it’s about more than showing sport, that shouldn’t leave you thinking that you can’t watch any big games here as you definitely can. Very much a restaurant where you can watch the big matches rather than a sports bear where you can get food, Parburg specialises in every kind of burger you can imagine. There are a host of beers on their drinks list, plus more than few spirits for those of you that like a stronger drink. Russia is the home of vodka after all! As mentioned, Parburg have a number of TVs that they’ll put any big games on, but this is more about getting a decent bite to eat than getting a romping atmosphere as you cheer on your team. The intention is to have two sky boxes on either side of the stadium, along with enough VIP seating for more than a thousand supporters. We do know that FIFA executives love their hospitality facilities, so expect this section of the ground to be up to scratch even if the rest of it is falling apart at the seams. 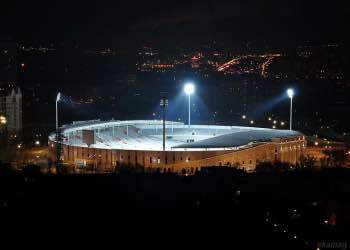 It’s not uncommon for football clubs to rent out their stadiums for private use in order to ensure that they make money even when there aren’t any football matches taking place. 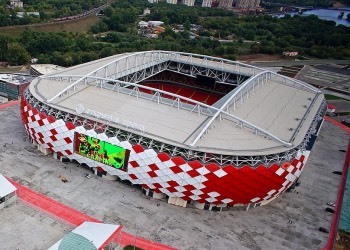 It’s likely that Cosmos Arena will be rented out in just such a way, depending on whether or not FC Krylia Sovetov want to make use of the new facilities they'll have available to them. Whether or not you’ll be able to do a tour of the Cosmos Arena remains to be seen, but once we have that information we’ll obviously update this section. 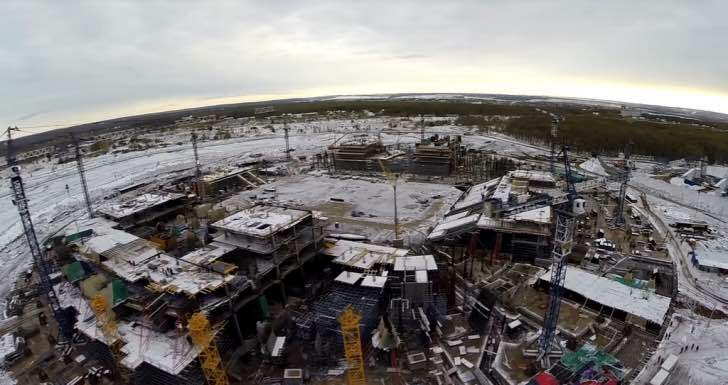 Considering that the Cosmos Arena hasn't even opened yet, it's got one of the most interesting histories of all of the new stadiums being built by Russia ahead of the World Cup. The original hope was that it would be built on an island on the South side of the city. 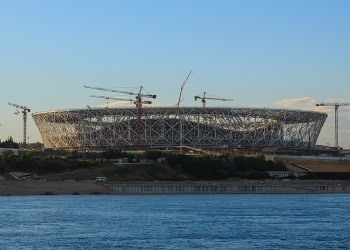 The problem was that there was no infrastructure whatsoever in that part of Samara, without even a bridge being in place from the mainland out to the island. 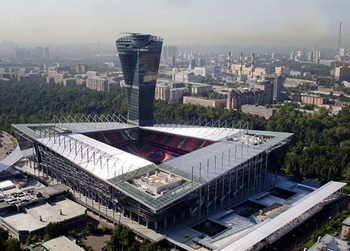 Not only would the Russians need to build a new football ground, they'd also need to put all of the various things in place to allow that ground to operate properly. A decision was made to move it to the North of the city instead, building it within the city's limits. 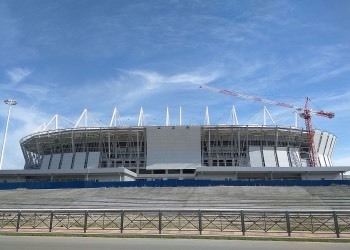 The area laid out for the new stadium was initially twenty-seven hectares, moving to two-hundred and forty hectares and then nine-hundred and thirty hectares. Interestingly, most of the planned construction for the area has nothing to do with the World Cup or even sports. That might perhaps explain why the increased space was decided upon before any consultation was done with the people that lived in Samara. All of that contributed to escalating costs, which eventually needed to be pulled back. 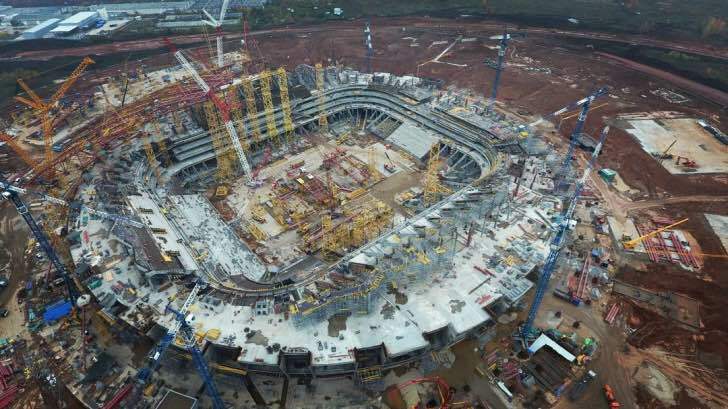 There was supposed to be an eighty metre dome at the top of the stadium, but that is likely to be closer to the sixty-five metre mark by the time it's finished. At the time of writing, the Cosmos Arena is the one that is most delayed in terms of when it is going to open compared to when it was supposed to. The first practice match wasn't even scheduled at the stadium until the end of April 2018, meaning that the ability for FIFA to check whether it's ready for the World Cup will go right to the wire. Obviously the most pressing concern for the immediate future is that the stadium is completed. 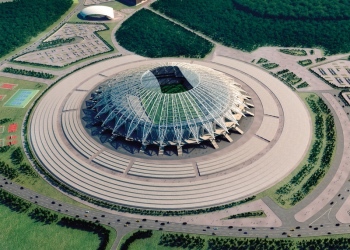 As we've already mentioned, in the wake of the World Cup the stadium will be handed over to FC Krylia Sovetov Samara. Whether or not they choose to make any changes remains to be seen.